While many of us work in swanky air-conditioned offices, our traffic policemen have to perform their duty in scorching heat. But this summer will be different, at least for Madurai’s men in uniform. The city is soon going to see solar-powered air conditioned traffic booths for these men so that traffic policing could soon be a cool job, quite literally. 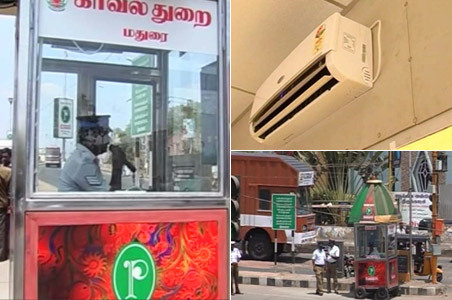 With the mercury crossing 38 degrees centigrade, these booths will give traffic policemen some respite from the heat and smoke. “They suffer, they breathe bad air and inhale smoke that comes out of automobiles,” said J Rajendran, Deputy Commissioner of Police, Madurai. Policemen say inhaling the smoke and dust often leads to disease and they welcome this cool initiative. “This will keep us away from diseases,” said Head Constable Arumugham. “This is good. This kind of encouragement will motivate us to work harder and longer,” added Gubendran, a Traffic Constable. Originally a gift from an NGO, now corporates have joined hands to replace all the 36 traditional traffic booths in Madurai with these. Once these booths are installed, the city will certainly become a role model for better working conditions for policemen. Former Team India captain Sourav Ganguly today assured West Bengal Chief Minister Buddhadeb Bhattacharjee of arranging Rs 50-60 lakh for relief to the Aila-affected people. Ganguly went to the Writers’ Buildings and called on the Chief Minister to express his sympathy with the cyclone-hit people of the state. After emerging out of the Chief Minister’s chamber, Ganguly told reporters that he assured him of arranging Rs 50-60 lakh for the cyclone-affected people. He said he would contribute the money after returning from England. He informed he would fly to London on June 05, 2009 to witness ICC Twenty20 World Cup. Ganguly had been assigned by the ESPN STAR Sports to give expert comment for two semifinals and the final match. In reply to a question, he said he had apprised of a disputed matter to the Chief Minister regarding his proposed school at Salt Lake in the city. The residents of CA and DA blocks of Salt Lake have been opposing construction of an English medium school on a 60-cottah land. They said already there are two institutions Salt Lake School and Haryana Vidyamandir and the proposed six-storeyed third school- Wiffren International School of Ganguly- would cause environmental hazards and create noise pollution as the area is very congested. Ganguly hoped the dispute would be resoved amicably. With companies keen on maximum utilisation of employees and low tolerance to poor performance in the backdrop of global economic turmoil, nearly 2,100 employees in software firm Infosys have faced the axe. “Some of these employees have been asked to go while some have left on their own,” V Balakrishnan, CFO of the Bangalore-based company, told PTI on April 11, 2009. Prior to asking the employees to leave, they were put on a performance improvement course and those who showed no improvement were asked to leave while some others quit, he said. “Tolerance to poor performance is very low given the current economic scenario,” said Infosys CEO Kris Gopalakrishnan. Usually, the employees who showed poor performance were given some more time to improve themselves, but this time there had been no such consideration, he said. Both the officials said the sacking was part of annual routine, which usually formed five per cent of the total number of employees but this time it was much lower. Some of the employees had been “outplaced”, Kris said, which refers to the firm hiring the services of placement agencies to help the employees to get placements in other firms. Infosys has a workforce of 105,000, including trainees.